With the crankshaft’s right-side and left-side thrust bearings inserted into the upper crankcase. Measure the thrust clearance “a” between the leftside thrust bearing and crankshaft using the thickness gauge. If the thrust clearance exceeds the standard range, adjust the thrust clearance. 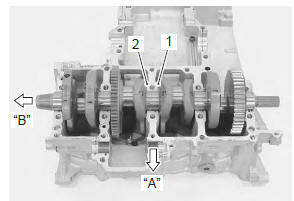 pull the crankshaft to the left (generator side) so that there is no clearance on the right-side thrust bearing. Remove the right-side thrust bearing and measure its thickness using the micrometer. If the thickness of the right-side thrust bearing is below standard, replace it with a new bearing and measure the thrust clearance again, as described in inspection 1) and 2). If the right-side thrust bearing is within the standard range, reinsert the right-side thrust bearing and remove the left-side thrust bearing. 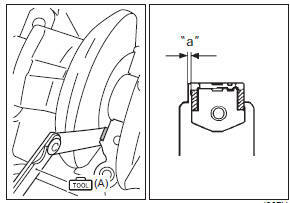 With the left-side thrust bearing removed, measure the clearance “a” using the thickness gauge as shown. Select a left-side thrust bearing from the selection table. right-side thrust bearing has the same specification as the green (12228-48b00-0e0) of left-side thrust bearing. After selecting a left-side thrust bearing, install it and then measure the thrust clearance again.